William Hughes, a native of New Cumberland, PA and graduate of Cedar Cliff High School, received his Bachelor’s and Master’s degrees in performance from the Mannes School of Music. 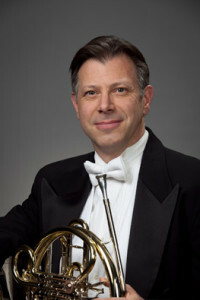 In 1990 Mr. Hughes was appointed Principal Horn of the Korean Symphony Orchestra in Seoul, South Korea, where he stayed for one year. 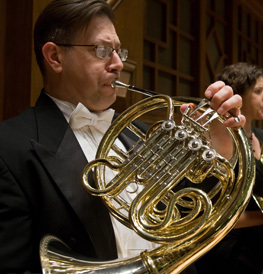 From 1991- 1993 he was Principal Horn of the Orquesta del Principado de Asturias in Spain. 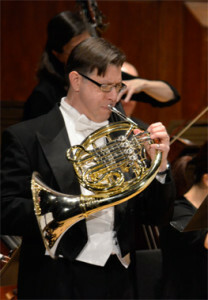 Currently Mr. Hughes is Principal horn of the Albany Symphony Orchestra and a member of the Harrisburg Symphony. He has also performed with the New York Philharmonic and the New Jersey Symphony. He has had the great fortune to work with conductors Leonard Bernstein, Kurt Masur, Zubin Mehta, Charles Dutoit, Leonard Slatkin, Zdenek Macal and JoAnn Falletta. He can be heard on over twenty recordings, most of which are with the Albany Symphony on the Albany Records label. Bill resides in Old Tappan, NJ with his wife Diana and children, Christina and Andrew.